Manas is situated in Kamrup-Golapara district, on the foothills of the Himalayas south east of river Manas along the Assam- Bhutan border. The beautiful park earlier known as North Kamrup is spread over an area of 391 sq km and was declared a sanctuary on December 01, 1928. It was established as the core of the Manas Tiger Reserve from April 1973 and elevated to the position of a National Park status on September 7, 1990. 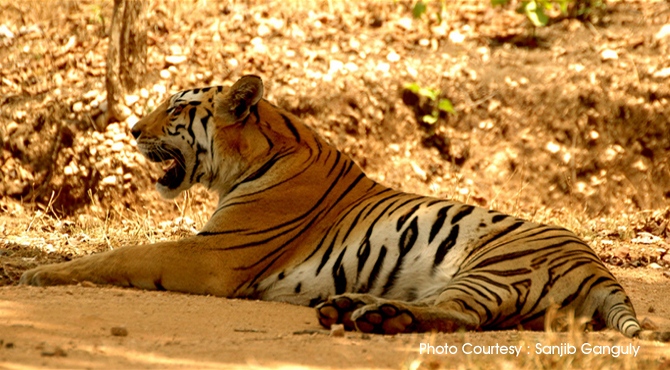 It was accorded the status of World Heritage Site in 1985 for its rare wealth of endangered species. The park extends over the national boundary to Bhutan where it is known as the Royal Manas Park. Manas is home to 20 of the most endangered species of animals which include the rare golden langur, hispid hare, pygmy hog, red pandas etc. The main highlight of the park is the Giant hornbill, two subspecies of which, the pied and grey varieties are found here. The park is rich in mammals and birds, which includes elephants, tiger, panther, leopard, clouded leopard, gaur, wild-buffalo, great one horned rhinoceros, rare golden langur, capped-langur, civet cat, squirrel, sloth beat, sambar, swamp deer, hog deer, otter, monitor lizard, gharial, python, great hornbill, florican cormorants, ergets and many other species of migratory and predatory birds. The major problem in the park is rhino poaching. The forests here are tropical moist deciduous type. They are interspersed with swamps. The wetlands are essential for the survival of the fast disappearing hispid hare. The Vegetation ranges from Khairsissoo-bhabhar grass community to semi evergreens. There are intermediate stages of succession-deciduous forests, swampy reed lands and Sal forests. The simul, khoir, udal, sida, bohera and kanchan are the common trees in and around the park. There are rides on boats, jeeps and elephants available. Elephant ride is the best to see the animals from close range rather than the boat rides. The 3 hour elephant ride starts from Mothanguri. Along the Manas river one can spot many water birds like mergansers, brahminy ducks, a range of egrets etc and otters can be commonly seen in the river.